Therese Dieringer (formerly Kolbert) was born in Pecs, Hungary in 1937. When she was seven years old Therese and her parents fled Hungary to Dresden, Germany, to escape the Russian communists. After Dresden was destroyed by firebombing, Therese’s family joined a caravan and walked west until they reached Bavaria, Germany. They lived there for seven years, but because they were a displaced people, neither German nor Russian, Therese’s family decided to move to America in 1952. The family ended up in Los Angeles thanks to a Hungarian priest who eagerly helped Hungarian immigrants settle in his community. Therese married in 1955 and in 1962, bought a farm in Scotts Mills, Oregon. She had never been a farmer, but she quickly learned how to milk cows and make butter and cheese. Therese did most of the farm work – tending to their herd of sixty cattle, growing food for her family to eat and canning over 800 quarts of vegetables, fruits & broths each summer. Money was always tight, so Therese eventually got a job outside the farm – as a cook for an Abbey retreat kitchen. Because she was needed mainly on weekends, she ultimately had to give up the job so she could raise her three children. Therese eventually took a job as a cook for a local school, treating the kids to made-from-scratch soups and other good foods. When the school was taken over by another district, a mandate was initiated to use pre-made, inexpensive artificial foods, so Therese decided to retire. But Therese hasn’t retired from feeding people by any stretch of the imagination! She shares her love through food, and lives to cook for people. The ultimate entertainer, when Therese invites you to dinner, she has planned every aspect from the appetizer to the dessert and the drinks to go with them. She shares her stories with flare and panache yet listens attentively as you share yours. Therese is the quintessential mother… a natural nurturer and giver. 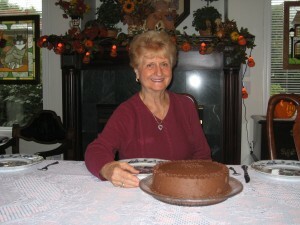 We’re grateful she’s given us her recipes to the delicious Hungarian specialties we’re serving up this month.